The core attraction of Nietzsche at the end of a century ravaged by ideology is that he provides no positive doctrines nor answers, and even made a fetish out of so doing, or not doing. So we make a fetish out of him. The number of new books devoted to Nietzsche is dizzying. What to do about it? Keep reading Nietzsche himself, I suspect. He writes so well, and, despite being uncommon and disregarded in his own time, it is right that he has gradually emerged as the outstanding critic of the modern age. Most biographers take hold of their subjects impersonally, treating them as psychological puzzle-boxes or objects in a petri dish. Bad biographers act as if their subject is some sort of titan or divinity, or conversely just want to sling some mud. But Lesley Chamberlain, in her 1996 biography of Friedrich Nietzsche (1844-1900), admits immediately that her desire is to “befriend” the subject – that Nietzsche is someone she personally would have liked to know. This may strike some readers as blatantly unprofessional, but then Nietzsche himself was an unprofessional who resigned from the University of Basel, renounced Prussian citizenship without taking another (therefore becoming stateless) and traveled from place to place in continuous search of clement weather (likening himself to the old European wanderers) while his writings alienated more and more people. Chamberlain’s study centers around his final year of sanity, 1888, during which he lived in Turin and wrote Twilight of the Idols, The Anti-Christ (which she translates as The Anti-Christian), The Wagner Case and Ecce Homo. Chamberlain had access to his letters and used them as a framework. It is in many ways a very pleasant read, full of warmth and sympathy for the philosopher, though Chamberlain strikes a fine balance in refusing to pity him; there are nostalgic visions of the Turin of Nietzsche’s day and idyllic moments as according to his letters he was very happy in Turin, enjoying the food, the walks, the music and the architecture. 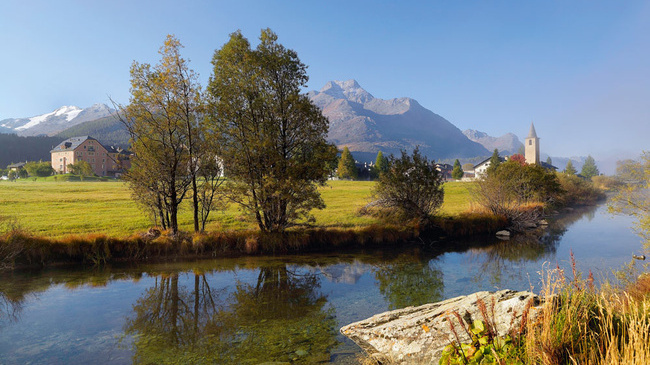 There is also a particularly beautiful description of his visit to the Swiss town of Sils. Chapter 6, “New Departures and High Mountains,” is one of the most successful chapters in the book, tackling the mountain as metaphor and Nietzsche’s seemingly hard-hearted themes (philosophizing with a hammer and his contempt of pity) alongside the descriptive passages of Alpine window-dressing. It makes for an excellent balance of intellect and emotion, theory and appreciation. In fact, this biography might be almost too pleasant were it not for Nietzsche himself. He was a man in perpetual poor health, his eyesight failing, caught between a real sense of loneliness and a desire to turn that pain into strength: “The year-in year-out lack of a really refreshing and healing human love, the absurd loneliness that it brings with it, to the degree that almost every remaining connection with people becomes only a cause of injury; all that is the worst possible business and has only one justification in itself, the justification of being necessary.” (From his letters). Nietzsche comes across in this study as a man who preferred people at a distance, attested to by his meeting with the Italian patriot Mazzini, whom he admired as an ideal of heroism…and whom he only met once. Doubtless he was happier with the ideal than the reality. The essence Chamberlain captures is that Nietzsche made his illness, suffering and loneliness into an ethical springboard for his philosophy. How shall humans escape suffering? What has been tried? Why failed? How exploited? What makes it worse? And how to make it better? Nietzsche in Turin also explores his conflicting opinions on religion, his overpowering admiration of Richard Wagner, his fears of inheriting the brain sickness that killed his father, his attitudes to Germany and his “misogyny.” Chamberlain also touches on a theory I’ve long held, that of the supplanted true calling – Nietzsche was a composer-musician at heart, just as M.C. Escher was a mathematician and Patti Smith a poet; this is what gives their works such a freakish originality. So this book humanizes the philosopher, so long left to the mercy of hysterical anti-fascists and snide caricaturists (not mentioning the sister-from-hell). The question is if Chamberlain’s sympathy makes it a whitewash. I can’t really address this issue, having read only one of Nietzsche’s books and no other critical material save a William Gass essay. 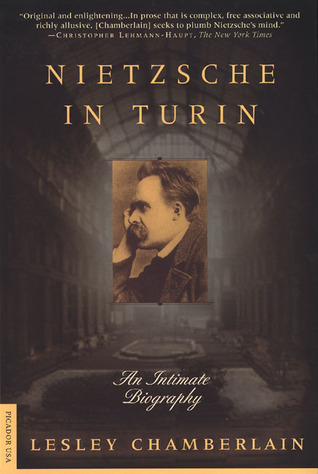 At any rate, a biography such as Nietzsche in Turin can only be considered supplementary at best – for people like me it serves for a good biographical introduction and for those more knowledgeable it may still prove absorbing. Though some will scorn it for being too unprofessional, accessible or softhearted, I think most everyone else will get something out of it. Her writing style is…odd. This early quote does nicely to sum it up and also show how she handles her subject: Meanwhile, he found waiting for him a letter from Resa von Schirnhofer, a young philosophy student with whom he had in recent years climbed mountains behind Nice, drunk a little vermouth and attended a bullfight. True, he would be rolling his trousers and eating a peach next, but he was such a nice man. Resa remembered him as a kind, impressive man who amongst much else urged her to read Stendhal. She loved his seriousness and relished his harmlessness. He evidently was touched. From the first days in Turin he wrote an engaging letter back to her about his new home and his latest ideas, the philosophy couched in the broadest terms and mixed with a note on his passion for Turin ice cream. Perhaps one of the book’s losses is Lesley Chamberlain herself. This is an intimate biography without an intimate biographer. She sits on the sidelines, exercising a British reserve. I realise it’s a delicate issue; one hardly wants a biographer waving her hands about saying “hey, I’m important too!” but I do feel Chamberlain was entitled to come out of her shell a bit more than she did. But rather like salt – better too little than too much. In the end, the book is nevertheless a moving portrait of an artist and thinker in decline, following him all the way to his final journey from Turin to the asylum, giving a blow by blow account of his descent into madness, from mild incoherency to unchecked megalomania to a final vegetative state. It’s a deeply sad end for anyone, let alone a man such as that. He dwelled in Turin as artist, as psychologist and self-interpreter, and as fallible mortal. As the sunlit weeks went by, with their ecstatic days, art rearranged decay, psychology deepened it, but nothing stopped its real onward march. A few last notes: Technically, I found the notes in back entirely useless, most referring to where in the correspondence (in German) quotes are to be found, rarely opening up into any aspect of the events, writings or people described. I’ve always had a suspicion that Picador USA is a weak-chinned publishing house and my edition of Nietzsche in Turin did nothing to alleviate this prejudice. Grammatical errors waver in and out of the text and of course on release it sank practically without a trace, though that might say more about the American reading public and its tastes than Picador’s marketing interests.